This crocodile was found in New Orleans swimming down the street. 21 FT long, 4,500 lbs, around 80 years old minimum.Specialists said that he was looking to eat humans because he was too old to catch animals. 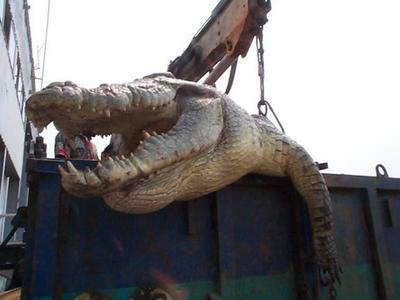 This crocodile was killed by the army last Sunday at 3:00 pm - currently he is in the freezer at the Azur hotel. The contents of its stomach will be analyzed this Friday at 2:30pm. My, my, how these critter stories get started. Who is gullible enough to think a hotel is going to place a 2 ½ ton gator in a freezer? Have you checked out the Azur hotel on the internet? I do believe it is far from the coast of the Gulf of Mexico! One who is familiar with reptiles knows immediately that the photo is NOT of an American crocodile. The American Crocodile (Crocodylus acutus) is an endangered species that lives along the Florida coast. Adult American crocodiles are 7 to 15 feet long and weigh 150 to 450 pounds. There are approximately 500 to 800 American crocodiles in Florida. American crocodiles can reach 60 to 70 years of age. They eat a variety of crabs, waterfowl, and small mammals. Decidedly less aggressive than the infamous Nile and Australian crocodiles, American crocodiles are rarely seen by people. The pictures are real enough, but they weren't taken in New Orleans. These are pictures of the Monster Crocodile of Pointe-Noire (in the Republic of the Congo). They've been circulating for over two years. This crocodile was really estimated to be 16 feet long and weighed about 1874 lbs – far from the 21 feet and 4500 pounds stated. These folks remind me of how in my early years I mastered the art of unintelligible talking. Yes, I took French in college, but I seem to have perfected the nonsensical talk to where the causal observer would think that I am fluent in this strange alien language. I describe it as a combination of French, Swahili, Iroquoian (language of the Cherokee), Mandarin, Cantonese, Taiwanese, and Fijian. I call it “Jim Speak” and it has been useful in my wanderings. You may say. “What does this have to do with the folks in the robes?” I recall in the 70’s I would often fly to Washington, DC, as part of my job. At the airport it was common that travelers would be confronted with members of the Unification Church donned in their white robes and sporting shaven heads. Reverend Sun Myung Moon heads the Unification Church and his followers are often called “Moonies”. When a Moonie with a flower in hand would approach me and request money, I would turn on my “Jim Speak”. The individual would smile and leave. Worked beautifully every time! When Mariam ( our close friends Sondra and Kazam Nasseri’s youngest daughter ) was small, I would use “Jim Speak”. Kazam is a good friend and was born in Iran. Mariam would listen intently as if trying to figure out if I was speaking English or Persian. To this day, I greet Kazam with my special language and he, of course, responds in his native language. It is a special greeting that we share. “Jim Speak” came in handy once when I was teaching an Elderhostel class. Elderhostel is a program that provides adventures in lifelong learning for older adults through educational travel programs. I had taken the group on a field trip to the mountains and I was driving a van full of lovely ladies who were Catholic nuns. As we traveled home, the ladies started singing hymns. It was a great memory. They asked if I could sing? Well I did a great rendition of The Sound of Music (Edelweiss) in “Jim Speak”. It was a great performance if I do say myself. The group was so quiet and after my performance, they clapped and would have given me a standing ovation if they could have stood in the van. They respectively never asked what language I had used to sing "Eldelweiss". If I see you and you heard a strange language emitting from my lips, you must be a friend! 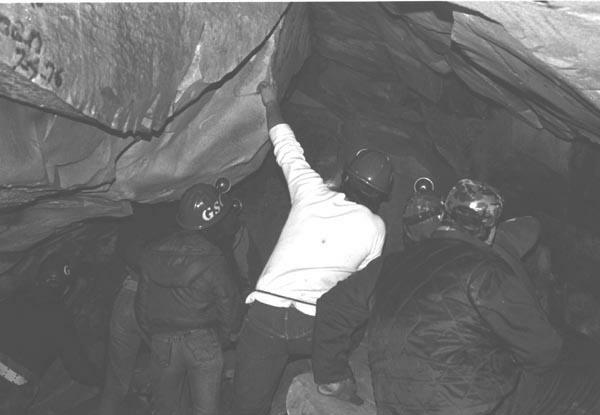 The photo shows some of my students in the GSC caving course exploring their way through the Bowden Cave system in Randolph county. Our class would not only just explore cave systems, but also conduct research as to organisms found within the cave and the physical environmental factors (temperature, water quality, humidity, etc.). I remember one spring morning arriving at Bowden Cave with our cave biology group and seeing a tent erected outside of the cave entrance. There was a light snow hugging the ground and the temperature was in the 30’s. It did not take long to realize that we had a couple of inebriated WVU college dropouts on hand. Yes, they said that they were going to explore the cave! They had a Coleman lantern and they were, as my mother would say “drunk as a skunk”. I assured them that a cave was no place to be when a person is full of beer. I was thinking on how many beer cans I have seen in caves and wondered why anyone would drink in this dangerous environment and even carry their beer back into crawlways and over underground cliffs! We left the WVU students (well, were!) and proceeded into the cave. Our teams were interested in trying to trap wood rats that have been on a decline in West Virginia. We setup our recording thermometers and left the cave. As we exited the cave we noticed two of our live box traps that were positioned close to the entrance were missing. Obviously the drunken “scientists” needed our traps. I questioned them about the missing traps and they assured me that they had nothing to do with the missing equipment. I told them if they see anyone with the traps to warn them that they have been laced with a cyanide compound and that a person must not touch them without protective gloves. (Yes, a lie!!) I wish I could have recorded the expression on their faces. As we left Bowden, the novice spelunkers were lighting the Coleman lamp to enter the cave. We were off to stay at the wildlife cabin at Otter Creek Wilderness Area and in the morning we would return to Bowden to check our traps and recording devices. We had a great supper with one of my students, Martin Arbaugh of Richwood, supplying fresh and tender ramps for supper. We arrived at the cave the next morning early. No one was around the tent so my students checked out the canvas abode and found- you guessed it – our live traps. They retrieved them and placed them into the van. A group of spelunkers from Pittsburgh had arrived and entered the cave a few minutes earlier. As we entered the entrance crawlway, we heard one of the Pittsburgh folks yell to hold up that two individuals were on their way out. They said that these two had spent the night in the cave. It was actually 24 hours that they were in their underground prison. It did not take a rocket scientist to figure out who these two individuals were. The two WVU students were wet and cold. They had taken into the cave only the Coleman light. They had slipped on the mud bank by the underground stream and fell into the icy water, which quickly extinguished the Coleman lantern. They were now in frigid water and in absolute darkness. They became sober quickly as they huddled together in the darkness of the cave and hearing only the rush of water through the cave system. The next 24 hours were spent on the slippery mud bank talking of dying and other equally pleasant topics. I told them that they had best stop by the Elkins emergency room for a checkup. I also gave the caving safety lecture about 3 sources of light necessary before entering a cave, required helmets, and other spelunking safety essentials. We then bid them farewell and we were off to collect cave data. I have wondered what happened to these guys and if this experience had made an impact on their lives. Life teaches us many lessons and, hopefully, we will listen and learn. This is the conclusion of Rachael's Thunder on the Sods. Because the area had been designated a forest area and therefore qualified as “uninhabited “ the U.S. Army decided that the Sods would be a perfect place to run military simulation war drills and to test new weapons during World War II. Land mines and bombs of various sorts were detonated. The land was scarred and pocked with shelling. The native animal life fled the thunder on the Sods. Once again, the life of the creatures on the mountain was disturbed. Thankfully, the war ended fairly quickly, and after the invention of the atomic bomb such primitive weaponry hardly seemed necessary. Military use of the Sods ceased. To this day, however, signs are posted with illustrations of land mines, all of which were not detonated or removed from the area, and instructions detailing what to do if one should happen upon such an archaic beast. Yet even its use by the military did not crush the resilient spirit of the Sods. The land began the arduous task of reclaiming itself, once more. The plant life returned, the bogs swelled. Deer, bear, and bobcats roamed freely. Eagles and hawks nest in the rocky cliffs known as Bear Rocks, as well as sparrows and spring warblers. This is no longer innocent land for it has experienced much: been charred by fire, battered by the elements, and profaned by man. The mountain’s history has altered it forever, left it visibly scarred. Yet, the wounds have healed; life never ends here, but continues to grow- - fuller, richer. The land has adapted arid evolved. It was my father who taught me to love Dolly Sods. This mountain is his special place. With the waters of Red Creek to wade in and swampy bogs to explore, my father is rejuvenated. The tiredness brought on by his daily struggle with arthritis visibly peels away, and new energy floods his body. Here, he is up for a morning stroll at sunrise then returns, shoes still wet with dew, to make pancakes for everyone before heading up the mountain to pick berries. He and the Sods commune: he returns with hope and restored wonder. As I sit on a rock covered with prickly, dry lichen, I am struck by how much we as people are like this land: resilient. Like my father, the land has experienced hardship, yet both are all the more beautiful for their scars. We too may suffer great traumas, experience shocking changes, yet the human spirit is never suppressed. There is a will to survive. We adapt, accept, go forward bearing the scars of these experiences forever, and growing from them. Life continues in a way I can only call miraculous. As I sit and pick blueberries that my family will freeze to eat later in the fall and winter, I look out over the horizon. I think I catch a glimpse of Mr. Rice’s mountain lion padding, silently across the clearing, and I smile. As I go through papers, I came across a wonderful paper written by my eldest daughter. I have cherished this story. There are some memories in life that touch your heart and are embedded there until death. Many of my special memories deal with Dolly Sods. My I share Rachael's story with you. “There is wildcats on this mountain.” Mr. Rice speaks softly, but his seventy-year old jaw is set firm, and I know he aims to convert the disbelievers. He has seen the fresh carcass of a deer down by Red Creek. Earlier that week, he heard the wild scream that only a big cat makes. “Twere enough to make a man’s hair stand ascaret! Ain’t no dogs, nor bears, nor any other creature in these parts that can make such an unholy a sound as that,” he testifies. Every summer that I can remember I have spent time here on Dolly Sods, a mountain in the Monongahela National Forest. My family stays in a small cabin community called Laneville at the foot of the mountain. There are never more than fifty people tucked into this valley at any time of the year, with the exception of the first week of hunting season when the cabins are overrun with testosterone, beer, and tall tales. Mr. Rice has lived here for years now. He is an authority on everything that happens on the mountain. Weathering out terrible winters, floods, and the hardship of being one of the only year-round residents, Mr. Rice senses the rhythms of this land. His life is intertwined with its. As you drive the steep gravel road up to the top of the mountain, the hardwood forest gradually shifts into a more rugged terrain. Oaks and maple disappear, and pines take over. Eventually, the pines fade as well. The peak of the mountain is covered with triangular flag spruce with their limbs blasted away by the wind on the west side. They point away from the cold that descends upon their mountain in winter, urging travelers to warmer climates. To many people this place might seem desolate or forsaken with its enormous exposed boulders and shrubby summer growth. Yet, to me, this land is sacred, beautiful because it has endured so much. There is hope in its history, and peace in its wildness. A hundred and fifty years ago, when this whole mountain was owned by the Dahle family, a hardwood forest covered most of the land. The rights to log were parceled out here and there over the years, and eventually the virgin wood was hauled away to become houses, furniture, boats, and coffins. Some people say it was the carelessness of the loggers that started the fire. No one seems to know for sure who was responsible, but a blaze began on the mountain and burned for nearly thirty years. Firefighters couldn’t control it. It raged above the ground until the trees and soil had all burnt away to leave the bedrock standing exposed. Then, it would disappear underground to burn in the peat moss until the wind would pick up again and resurrect it roaming. When the fire finally ceased, grasses and shrubs began to return, then flowers, blueberries, and spruce. Peat bogs with their sticky carnivorous sundews, dense mosses, and cranberries reclaimed the blackened surface. Yet, there was little time left for recovery before the next disaster, the entrance of the federal government. The Final Part of Thunder on the Sods will be posted tomorrow. If you folks have not noticed, it is rapidly approaching the fall season. This photo is of witch hazel - one of those neat plants that bloom in late fall. Drooping clusters of yellow flowers appear in the autumn when the leaves are falling and give way to a woody capsule ejecting two shiny black seeds the following year. 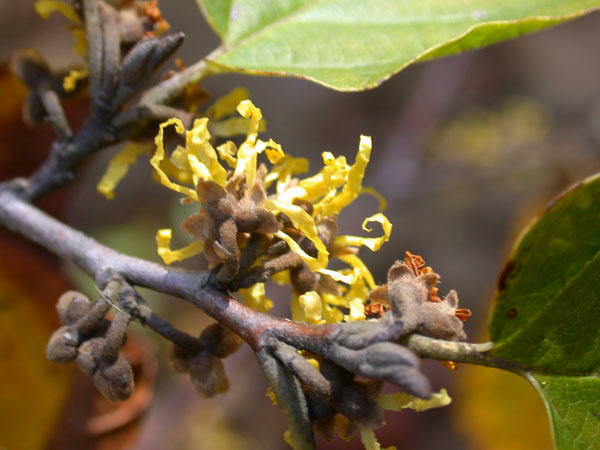 Witch hazel is used to contain bleeding and excessive mucous discharge from the digestive system. It may be applied topically for external hemorrhoids, varicose veins, bruises, sprains and localized inflamed swellings, spots and blemishes. It can also be applied to insect bites and minor burns such as sunburn. It is well known in the form of distilled Witch Hazel, which may be used externally and internally, wherever there has been bleeding. It is an ingredient in eye drops, aftershave lotions and cosmetic preparations. 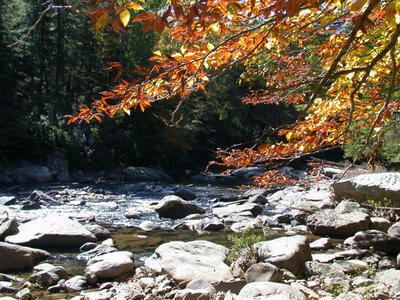 This photo was taken at Audra State Park in the campground area. 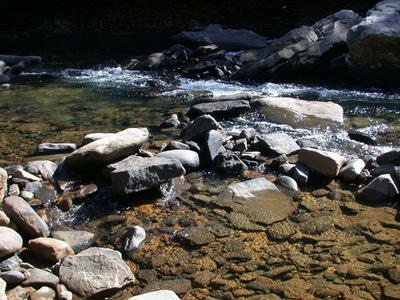 Audra State Park is located near Buckhannon, WV, and is on the Middle Fork River. We have always been drawn to the natural beauty of the Middle Fork River and its surroundings. People who love the outdoors will not be disappointed. The gorgeous woodlands surrounding Middle Fork River provide the perfect setting for both hiking and picnicking. Alum Cave boasts unique scenery. The most breathtaking view can be seen while walking the boardwalk built along the cave's overhanging ledge. Swimming is allowed in the Middle Fork River. Although it is not an Olympic-sized pool, it is majestic nonetheless since Mother Nature carved it out of the earth. You need to enjoy the fall with all of its uniqueness and beauty. Keep your eyes open along the streams for witch hazel and its unique blossoms. 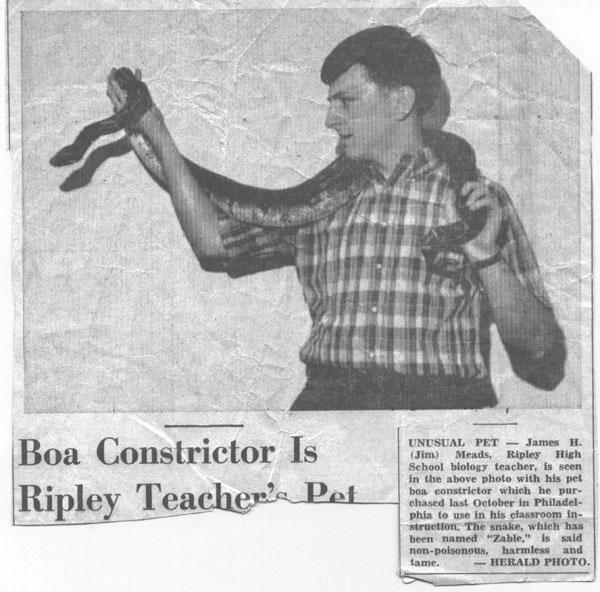 Unusual Pet – James H. Meads, Ripley High School biology teacher, is seen in the above photo with his pet boa constrictor which he purchased last October in Philadelphia to use in his classroom instruction. The snake, which has been names “Zable”, is said non-poisonous, harmless, and tame. I have a few thoughts about this article. First, I must have purchased the snake in October as my birthday gift! Yes, the good wife always says that I go out and buy my own birthday presents. Guess she may be correct. Secondly, it is always interesting to see how folks react to snakes. In the late sixties, the keeping of snakes was not as common as it is today and snake keepers were viewed as “very peculiar”. I always love the question that I used to get when I placed a large snake on my shoulders. “Is this snake poisonous?” I would think the answer would be obvious when I am holding it with head free and obviously it is free to roam around me! The article says the snake was tame! Tame is a relative term when it comes to reptiles. They are wild animals and one has to be constantly aware of their behavior. Zable was an interesting snake. We lived in a mobile home in Ripley and had limited room. My Dad built a nice cage for Zable with lights, Plexiglas front, and paneling. The only place that we could easily fit was in the bathroom beside the ceramic throne. Zable came in handy one day when a salesman came to the door. He said that we would get a free gift if he could have 5 minutes of my time. He was persistent and I was young and naïve. He was selling photo packages that started at $400 dollars with leather frames. I said I was not interested. He proceeded to then present cheaper packages and other combinations at varying prices. After 40 minutes of this presentation, I had enough! I hate to be rude so I excused myself and proceeded to go to the bathroom, placed Zable around my neck, and then returned to the living room. I then sat on the couch and continued to listen to his spiel. Well, I should say the spiel stopped quickly when the fellow looked at Zable. The salesman immediately started placing all his materials, that were strewn over the carpet, into his cases. Within 2 or 3 minutes the fellow was escaping out the door. He thanked me for my time as he ran to his car. Yes, sometimes reptiles really come in handy! By the way, we did not get a free gift from him - except the memory of his terrified face and his frantic removal from our abode. While visiting family in Charleston, South Carolina, we have had the opportunity for several years to experience the city and local area. It is a great location for not only sightseeing, but also to observe aspects of nature that we do not see in the Appalachian Mountains. On our last visit, our daughter took us to a special spot just a short drive from Folly Island. We visited Angel Oak Park, which is the home to "the oldest tree east of the Mississippi." 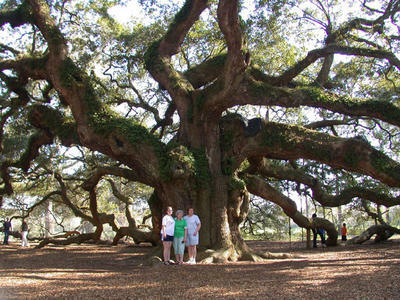 The Angel Oak is a live oak, a tree native to the southeast Low Country, especially the Sea Islands. Although the age of Angel Oak has long been reported to be in excess of 1400 years, the actual age has never been scientifically substantiated. This is because live oak trees have a tendency toward heart rot, which makes the core samples useless. Live Oaks are not tall trees; however, their canopies are exceedingly wide. Only in the very oldest specimens, like the Angel Oak, do you find massive limbs, heavy by the weight of the years, resting gracefully on the ground. 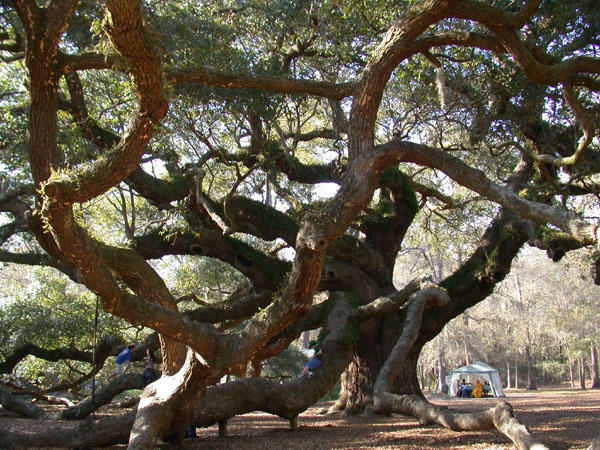 Many people mistakenly believe the name "Angel Oak" refers to a type of Live Oak, but actually this name comes from Martha and Justis Angel who were owners of this property generations ago. This tree is breathtakingly huge!!! The dimensions of Angel Oak are as follows: Height - 65 Feet, Circumference - 25.5 Feet, Area of Shade - 17,000 Square Feet, Largest Limb - 89 Feet Long, 11.25 Feet Thick.